The first time I drove a Hyundai Kona Electric, it was in rough prototype shape on a frozen lake in northern Sweden. That was back in February, and getting to spin the wheels in the honking traffic of Los Angeles last week made it clear that the company has done tremendous work in the intervening months to introduce one of the best all-electric vehicles on the road today. The competitive set for electric vehicles is an interesting and developing group of vehicles. They all have one simple thing in common – the zero-emission powertrain – but they differ widely in cost, range, and looks. The first two numbers are easy to compare — well, they will be once Hyundai releases pricing information for the Kona Electric. This figure was promised at last week’s event, but that promise has not yet been fulfilled. So let’s skip that for now and look at the range. 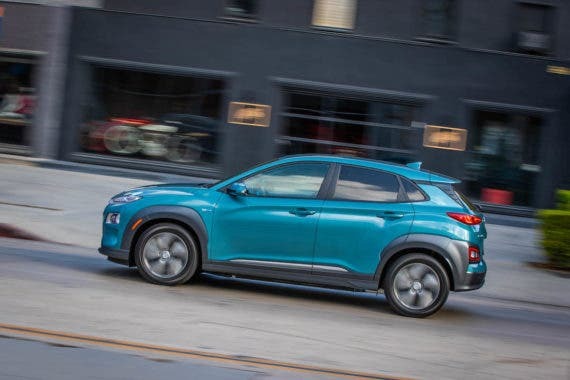 Hyundai announced earlier this year that the Kona Electric would have an estimated 258 miles of range from a 64-kWh battery pack. That tops the Chevy Bolt’s 238 miles and the 220 miles for the standard Tesla Model 3 EVs (of course, the long-range Model 3 will go 310 miles, but that does come at a cost). While EV fans are used to looking for the electric car with the longest range, I think now that we have a fair number of choices in the 200+ mile category, it’s fair to stop thinking the highest range it the be all and end all of “must have” feature. Two hundred miles is way more than enough for almost every driver almost every day, and so now we can pay more attention to infotainment features, safety options, and style. The Kona Electric certainly delivers on these fronts (well, with style reasonable people can always disagree), offering three trim levels – SEL, Limited, and Ultimate – that can include things like a heads-up display, 8-speaker Infinity premium audio from Harman, heated and ventilated front seats, and an 8-inch touchscreen navigation system. On the safety front, the Kona Electric offers forward collision avoidance assist with pedestrian detection, blind spot collision warning, and lane keep assist. These are all features Hyundai has placed in the gas-powered Kona as well, a sign that the company knows what keeps its small CUV buyers happy, no matter what the powertrain is. The Ultimate Kona Electric even offers Smart Cruise Control, which the ICE Kona does not. When it comes to charging, the standard 7.2 kW onboard charger will fill up the battery in about 9.5 hours, while a 50kW DC Fast Charge gets the job done in 75 minutes (that can drop to 54 minutes with a 100kW unit). So, you’ll be ready to go while ensconced in some of the latest safety tech the auto industry can provide, you’ll have Apple CarPlay or Android Auto or SirisXM and a built-in nav system to get you where you want to go. But will it be fun? Part of that joy will be the instant, smooth linear electric acceleration that make any given EV more fun to drive than any given ICE vehicles. In the Kona Electric, you’ll want to shift over to Sport mode for maximum fun, while the Eco and Comfort modes are better suited for the stop-and-go traffic we experienced during about 90 percent of the LA drive route. Thanks, other people. When you do have a bit of unoccupied road in front of you, pressing on the accelerator lets the 150 kW motor spit out its 201 horsepower and 290 pound-feet of torque without any gas-infused growling or excess vibration. The Kona Electric has a 0-60-mph time of 7.6 seconds, which pales in comparison to a Tesla Model 3, but again, there’s the suspected price difference to take into account. Even when you’re not trying to chirp the tires, the Kona Electric is fun to maneuver down the road. Quiet even on the highway, the zero-emission small CUV asks you to play with it. The multi-link rear suspension keeps the Kona EV planted, while two paddles mounted on the back of the steering wheel let you adjust the brake regen levels on the fly, from 0-3. If you’re familiar with adjustable regen, skip to the next paragraph. Otherwise, know that the 0 setting is great for coasting on the highway while the 3 is best for steep downhills or busy traffic. The Kona Electric also has a Smart Regen, which will automatically adjust its regen braking levels to keep you away from car in front (but not totally avoid an accident, so stay alert, as I learned while trying this out). When you really want to slow down without tapping the brakes, you can just hold down the left paddle and a pseudo “level 4” will engage and slow you down with enough G force (.25, to be exact) to bring you to a complete stop and trigger the brake lights. This is cool and engaging, but I happen to prefer the true one-pedal driving in EVs like the Bolt EV. Still, the way that Hyundai has implemented the paddles here is worth exploring. And exploring EVs is really where the fun is, right? To do that, let’s go back to the Kona Electric’s competition. Obvious competitors include the Bolt EV, Tesla Model 3, and the Nissan Leaf. Hyundai will focus its sales efforts in California, where roughly 80% of the EVs sold in the US are purchased, and New York (another 10% or so). 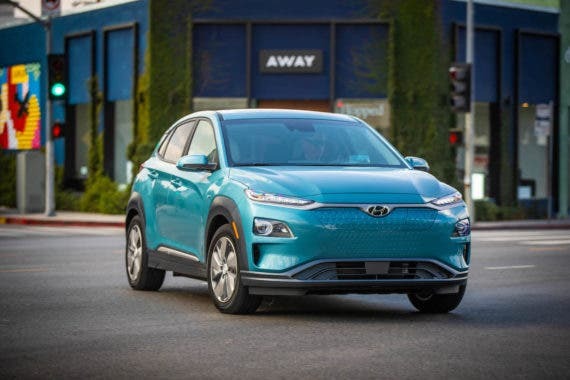 That means that the Kona Electric will be competing with every EV available in the US right now, from the BMW i3 to the VW e-Golf to Hyundai’s own Ioniq Electric. The Kona Electric stands out from the crowd thanks to its range and shape. It’s about the same length as the Bolt EV and the Soul EV, but a good 12 inches shorter than the Leaf. It’s also a smidge shorter than either the Bolt or the Leaf. Even so, it has 19.2 cubic feet of cargo space, not that much less than the Leaf’s 23.6 and more than the Bolt’s 16.9. Coming full circle, the Kona Electric offers a lot to the electric vehicle shopper. The exact value, though, will have to be determined once Hyundai is able to finally nail down a price (and will it offer the Kona Electric through a subscription service the way that the Ioniq is available?). Until then, get ready for your own test drive, and enjoy.